Prince Of Monaco Andrea Casiraghi and Tatiana Santo Domingo celebrating their engagement aboard Princess Caroline's yacht the Pacha III in St. Jean Cap Ferrat, France on July 15, 2012. The couple was joined by Andrea's sister Princess Alexandra, Princess Caroline and Charlotte Casiraghi at a private villa were they continued to celebrate. 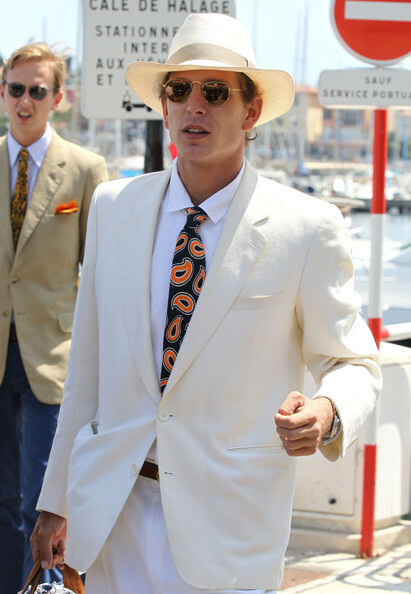 A white blazer topped off this impeccably chic outfit for Andrea Casiraghi, as he and fiance Tatiana Santo Domingo celebrated their recent engagement in France.